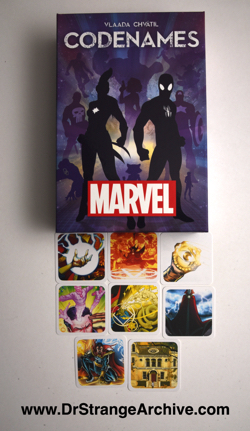 Size: 6 3/16" x 9 3/16"
Description: This is a card game where S.H.I.E.L.D. agents and Hydra agents compete to identify all of their team's asset cards displayed on a secret grid. Dr. Strange is referenced on 8 cards: Levitation, Magic, Doctor Strange, Sanctum Sanctorum, Astral Projection, Eye of Agamotto, Conjure and Energy. Each card measures 2 1/2" x 2 1/2".